NUWC Keyport Dedicates New Pier Navy News Stand 17 Sept 2002-- "Our pier is number one" stated Capt. Mary Townsend-Manning, commanding officer of Naval Undersea Warfare Center (NUWC) Keyport, as she presented the center's new Pier 1 on Aug. 29. 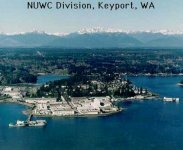 Located in the state of Washington, the Naval Undersea Warfare Center (NUWC) Division Keyport is the Navy's sole repair and maintenance depot for torpedoes and undersea mobile targets. In this capacity, Keyport - with remote sites in Hawaii, Southern California and Hawthorne, Nevada - provides test and evaluation, depot maintenance and repair, In-Service Engineering and fleet industrial support for torpedoes and other undersea warfare systems including mobile mines, unmanned underwater vehicles and countermeasures. Further efforts include responsibility for undersea combat systems and foreign military sales to many Allied countries. To support these activities, Keyport maintains and operates three underwater, three-dimensional tracking range sites with the capability to conduct vendor acceptance and in-service testing and evaluation of undersea weapons. At Keyport's main site, some 200 of the 1,500 resident civilian and military personnel, together with more than 160,000 square feet of industrial shops, are dedicated to processes that span prototype development to manufacturing and refurbishment of small components and entire systems. Programs in this area include R&D Test bed supportFlexible Computer Integrated Manufacturing, Electronics Data Interface, Computer Aided Design/Computer Aided Manufacturing Initiatives and Manufacturing Technology. 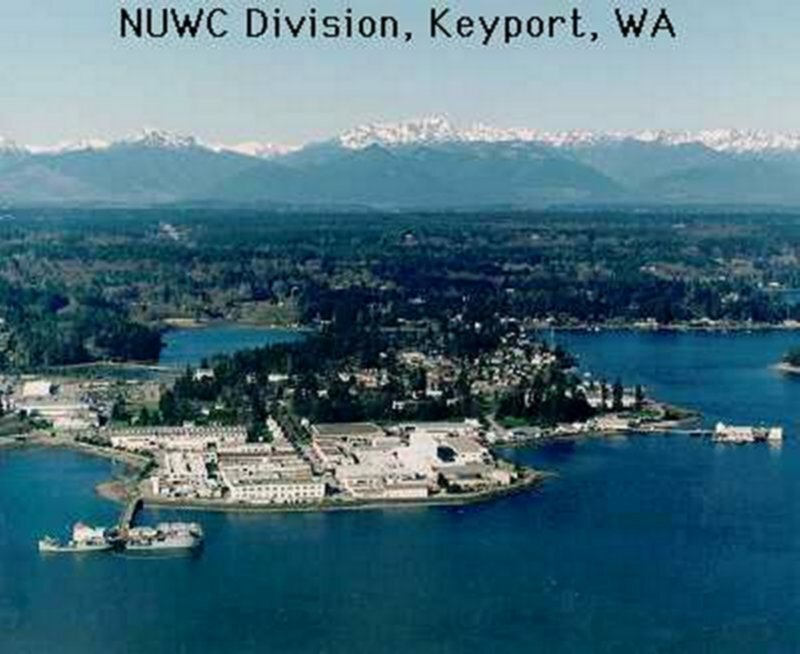 Naval Undersea Weapons Engineering Station (NUWES), Keyport is a small facility positioned on a small promontory on the south side of a narrow passage that connects Liberty Bay with the northwest end of the waters of Port Orchard. NUWES Keyport has two piers, designated as Pier 1 and Pier 2. Pier 1 has a moorage length of 495 ft, a width of 76 ft, and an alongside depth of 21 ft. Pier 1 can accommodate two YTT's. Pier 2 has a moorage length of 950 ft, a width of 48 ft, and an alongside depth of 19 ft. Pier 2 can accommodate ten small craft. Deck height of each pier is 17.6 ft above mean lower low water (MLLW). Operations at the Keyport Naval Undersea Warfare Center ended in FY91. Operations, including plating, torpedo refurbishing, and improper disposal practices, contributed to contamination found at the installation. Environmental investigations since FY84 have identified several site types, including Underground Storage Tanks (UST), sumps, spill sites, and an underground trench. The installation has made significant progress in its environmental program. In mid FY92, a Removal Action was completed at a chromate spill site. An underground trench and several sumps were excavated and chromium-contaminated soil was removed and replaced with clean fill. In FY89, the installation formed a Technical Review Committee (TRC), established an Administrative Record at the Engineering Field Activity, Northwest, and created an Information Repository at the County Library. A Community Relations Plan was completed in late FY90. Since then, several fact sheets have been completed, a door-to-door community survey has been conducted, and six open houses and workshops have been held. To improve site management, regulatory agencies are involved in developing the scope of work, and during document planning phases, technical memoranda are prepared to convey issues before document finalization. South to southwesterly is the prevailing wintertime wind direction, and is commonly observed from late autumn through early spring. Unfortunately, it is the worst wind direction for the facility. Because small craft are the primary users of the facility, they are adversely impacted whenever strong winds are present. Vessels will not be moved if small craft warnings are issued. In Aug 2002 NUWC Keyport dedicated a new Pier 1. Pier 1 replaces two World War II vintage wooden piers that had outlived their useful life and become expensive to maintain. At a cost of about $5.9 million, the pier results in a cost avoidance of $3 million for utilities, maintenance, dredging, and required upgrades. The new pier includes steel pilings, which will keep it environmentally sound and provide many decades of service that could no longer be expected from the former piers. After many months of construction, and with the visit of the YTT 10, Discovery Bay, and mooring of other craft at Pier 1, residents in Keyport and Lemolo are again seeing the Navy's craft frequent the waters of Liberty Bay.